In late 1981, the U.S Air Force awarded Vought (LTV) a contract to develop a small guided air-to-ground anti-armour missile, which would use only its kinetic energy to defeat its targets. The project was known as HVM (Hypervelocity Missile). 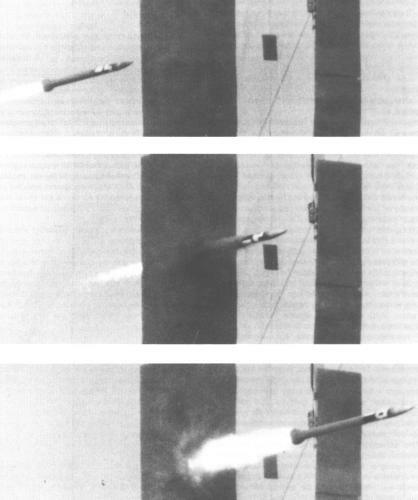 The HVM was powered by a solid-propellant rocket motor, which boosted the missile to a speed of 1500 m/s (5000 fps). The missile was spin-stabilized and used small thrusters to change its flight path. A FLIR (Forward-Looking Infrared) sensor in the launching aircraft could acquire a target and, after the HVM was fired, track both target and missile. A laser command guidance link was used to send target position updates to the missile, whose guidance processor could then correct the flight path. The "warhead" of the HVM was a heavy metal penetrator rod located in the missile's nose, and could penetrate heavily armoured AFVs (Armoured Fighting Vehicles). The proof-of-concept development phase of HVM culminated in a fully successful guided test flight in March 1983. In October 1984, the USAF, U.S. Army and U.S. Marine Corps agreed to jointly develop the HVM into an operational weapon, which would include a surface-launched variant. The Air Force variant, which was to be fired from underwing rocket pods on A-10 aircraft, was apparently cancelled at some point (probably in the 1987/89 time frame). In 1988, LTV teamed with Texas Instruments to offer the HVM for the U.S. Army's AAWS-H (Advanced Anti-Tank Weapon System - Heavy) requirement. This entry was eventually accepted for development, and in the long term resulted in the MGM-166 KEM (Kinetic Energy Missile) of the LOSAT (Line-Of-Sight Anti-Tank) system. The KEM is significantly larger than the original air-launched HVM demonstrators, though.